Sometimes a pair of shoes becomes way more than just a pair of shoes! About 12 years ago I bought some rather odd looking slip-ons, and wow . . . they were way more comfortable than I ever imagined! As we eased into pre-tirement, we decided to move away from public view and dress codes, into sole-full comfort in a casual sort-of way. And at that transitional time, we happened onto a pair of brown leather cartoon shoes, and I was hooked. For me they symbolized a life-style change and a different way of being that meant the world to us at the time—and still does. The decade that followed brought with it many happy steps and wanderings since they fit like a glove, so to speak. You might say those shoes and I became best friends and went everywhere together. That is, until the soles started to wear out. Instead of developing holes, the thick rubber just began crumbling away. Wherever I stepped, I left a trail of dry black rubber debris behind, which wasn’t very cool. Since I wasn’t yet ready to say good-bye, I retired them to the top shelf for a few years while I thought things over. Then one sunny day, we were walking down Via Borgo La Croce on our way to the Astra 2 to catch the latest movie. Just before Piazza Beccaria, I noticed a small negozio, shop called the Clinica delle Scarpe, Shoe Clinic. Hmmm, we wondered if they might be able to salvage those old favorites? Shoe repair shops are hard to find these days, so we decided that we had nothing to lose and brought them along on our next trip into town. The shop was very small, as you might guess—no more than 10 feet wide but plenty deep. It smelled like the perfect blend of leather, glue, shoe polish and dust, along with the faint whiff of miscellaneous feet. It was actually a very interesting aroma, in a strange sort of way. A smiling man and his watchful wife (presumably), seemed to be the owners/workers. Judging from the teetering stacks of shoe stuff, they appeared to have been in business there for many years. They were really cute together. When we pulled the sorry looking broken shoes from our white plastic bag, the friendly man examined them at the front counter. For some unknown reason, the woman appeared to be eaves-dropping, since she volunteered questions and answers from the back of the shop. They were the perfect team, anticipating each others’ thoughts and moves—like synchronized swimmers, without the water. They accepted the challenge and said my renovated footwear would be ready for pick-up on Friday. 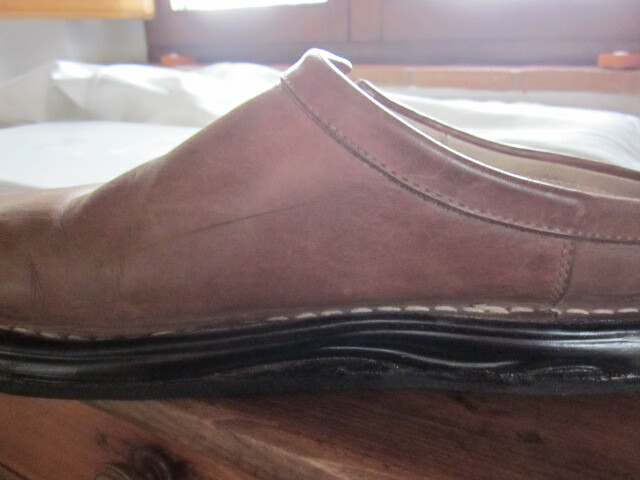 I explained carefully how important it was to keep the original sloped profile of the rubber soles since it was a critical part of the mystery that attracted me to them in the first place. 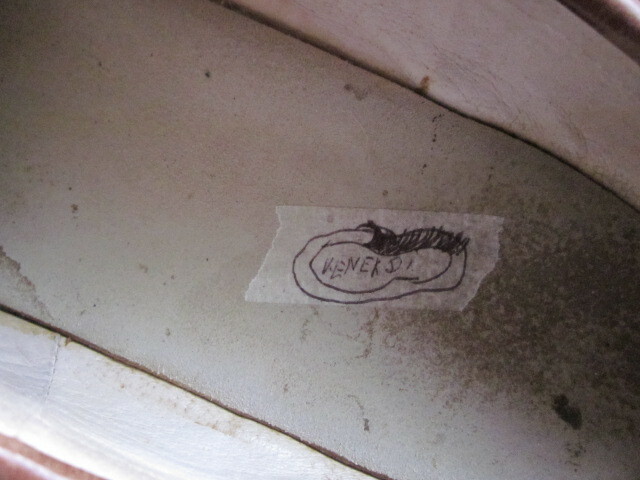 He seemed to understand my emotional connection, and turned to scribble some kind of cobblers code on a piece of masking tape. Then, he asked me for 35 euro. Normally in Italy, we never pay for anything in advance, and sometimes not even for years later. But, evidently he’d been burned a few times, leaving him to “foot the bill,” so to speak. We were more than happy to pay ahead since we liked their style as a trustworthy duo. Yesterday, we went to pick up the shoes at the clinic. We thought we’d give them an extra day, you know, just in case. We were shocked at how great they looked—almost like new, except for the subtle patina on the leather that hinted at their real age. Fantastic! We were pleased, and they were pleased. It was one of those perfect transactions: the shoes were delivered on time, within budget, and exceeding expectations. What more could you want? It’s those little things in life that really make a difference. 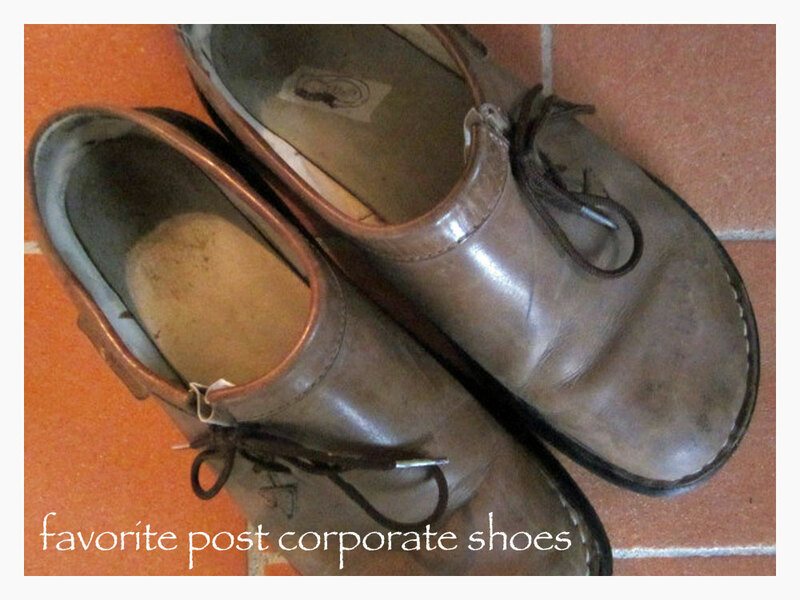 Ah, the joy of wearing old shoes that make you feel good inside! And that, coupled with meeting honest people who keep their promises, left us grinning like Cheshire cats as we turned to walk away. Now that was one of those beautiful days in Italy! 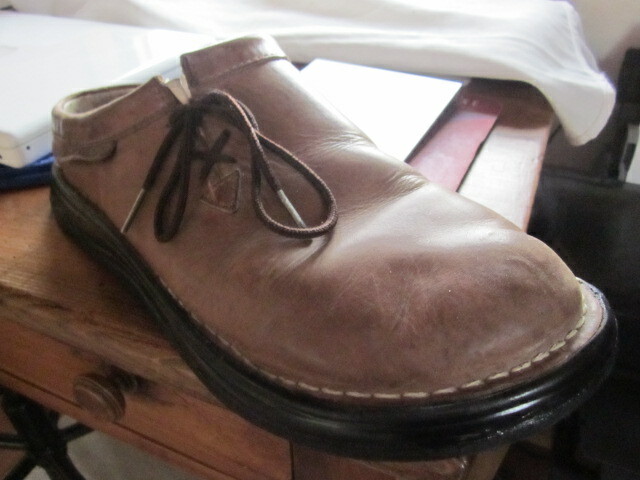 I used to have a wonderful shoe repair shop in Florida that I took my favorite shoes to be repaired. Here in New England, I have not been so lucky. It sounds like you found a treasure with a shop that is both honest and talented. The shoes got their first test run this weekend. Unfortunately, they have a bit of a problem. Now, we’ll see what honesty and talent really look like! Thanks for the read and the comment.